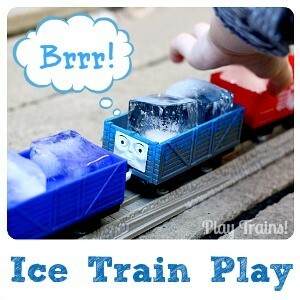 I’m always trying to think of ways to bring the Little Engineer’s favorite indoor activities and toys outside. 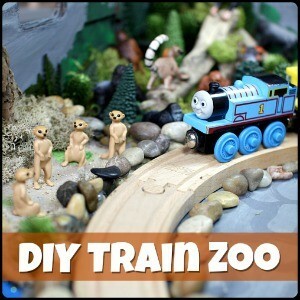 I’ve wanted to make a “train garden” on an outdoor train table for a long time now. But I was always put off by the thought of all the work it would be to design and build one. 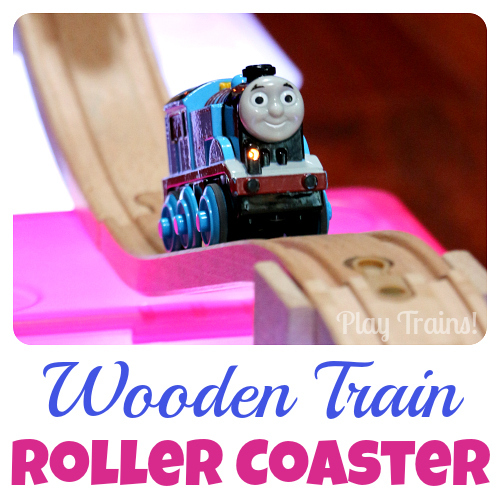 Until this summer, when I realized that I could make a wooden train garden railway for the Little Engineer without using a single tool. 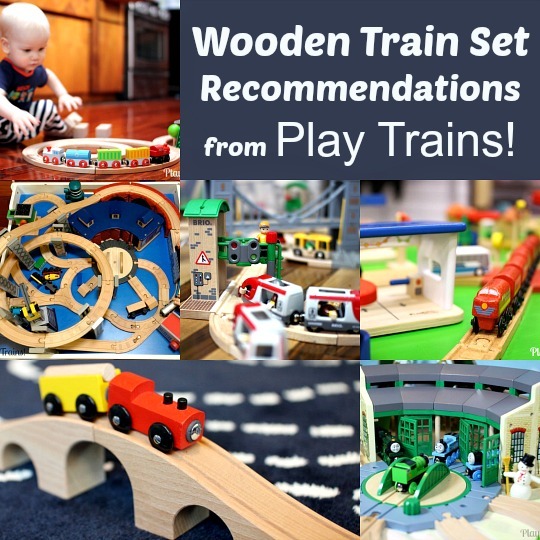 This is a super easy way to bring train play outside, and the results have delighted us both! The Little Engineer was two years old when I first got the idea to make an outdoor train table. 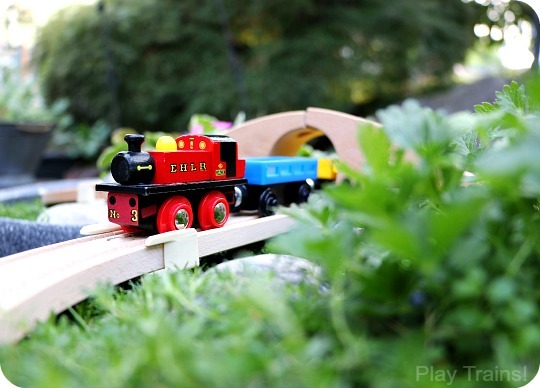 We had been watching videos of garden railways on YouTube, and I thought it would be fun to have a mini garden railway with wooden trains in our backyard. 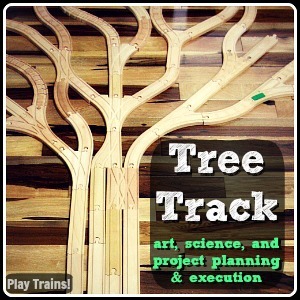 I had visions of building a train table that could hold a layer of dirt for planting a landscape. My husband pointed out that we’d need to work in some sort of drainage system. The idea started to sound more complicated than fun. 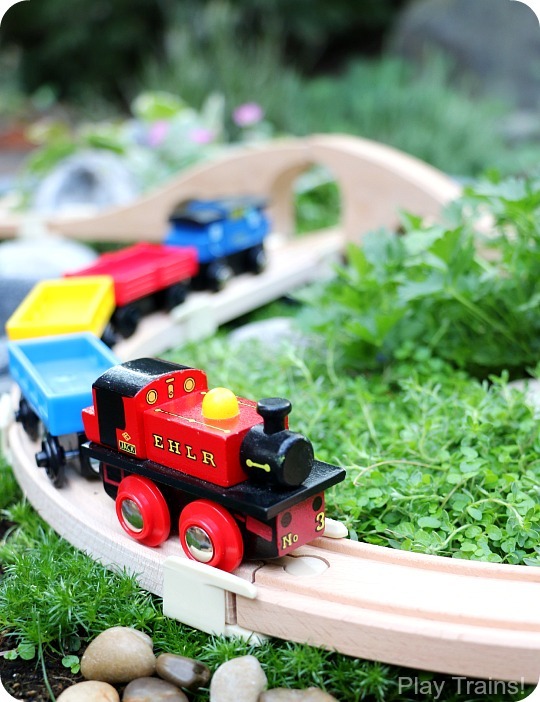 The next summer, the train garden idea wormed its way back into the forefront of my mind — nudged there, I think, by seeing Fun at Home with Kids’ super cool dinosaur garden — but once again it sounded like a lot of work. And then what would we do with the table when the Little Engineer got too old for it? This year, the right inspiration finally came to me. I was staring at a few big pots on our deck that were in need of new plants. 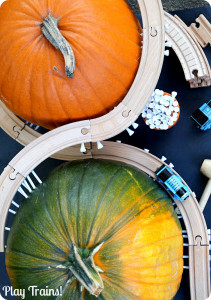 For the first time, I noticed they were pretty much the perfect height for a train table! 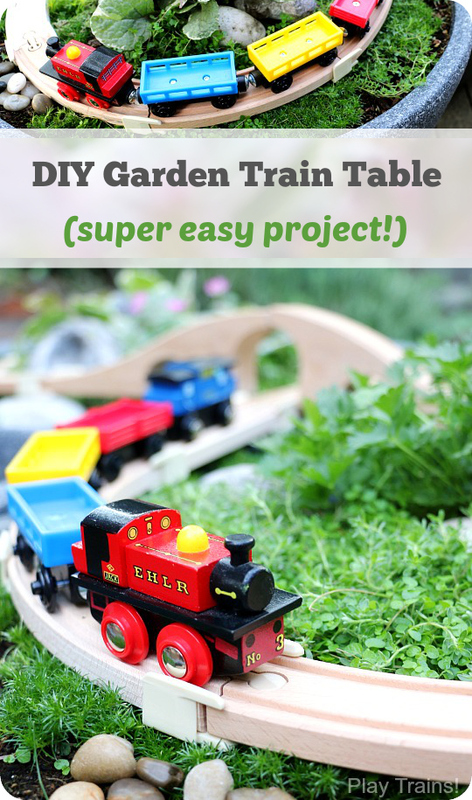 Now, of course, this isn’t really a “table.” But it works pretty much how I imagined my garden train table would work, so I’m okay with that. 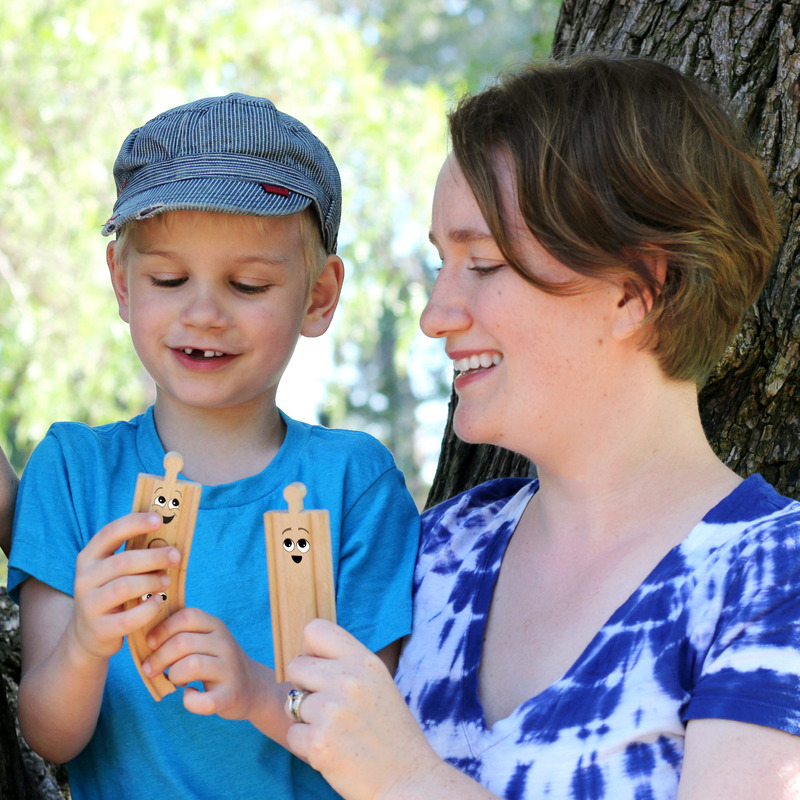 I love that this is a project that anyone can make in an afternoon. 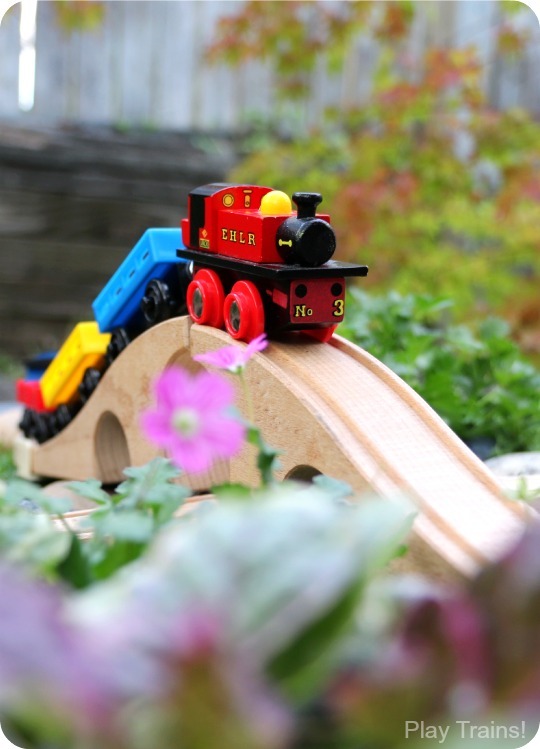 I love that it can serve several purposes — already, our train garden has doubled as a bunny garden, and as a place to take pictures of LEGO minifigures. And I love that when the train “table” isn’t in use or is no longer needed, you have potted plants decorating your outdoor space. Lots of planting soil: The pots need to be filled to the top, so it might take more than you think! Plants: I picked “steppable” varieties for our plants so that the garden would hold up to being played on with wooden toys. (So far, so good as far as that goes!) For the outer area where the tracks go, I used Scotch and Irish moss, and also some creeping thyme that creeped out of the center where I planted it. You might consider planting herbs in the center of the pots to add another sensory element (look for ones that don’t grow very tall). Rocks or other decorative features: We used rocks we already had lying around the backyard. 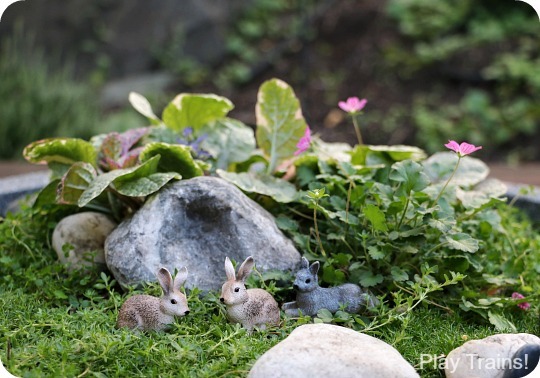 As for other decorative features, check out the list of fairy garden links at the end of the post for plenty of inspiration! 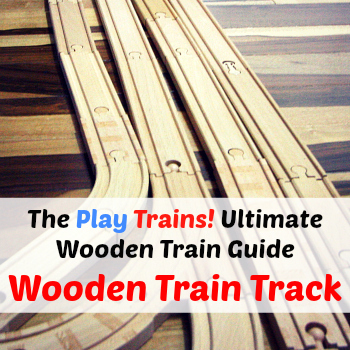 Wooden train tracks: For one pot, you’ll want eight large curved tracks to make circle. You might be able to add a couple of short straight tracks to make an oval, but I think the circle would look nicer. For the two-pot version, you have more options. 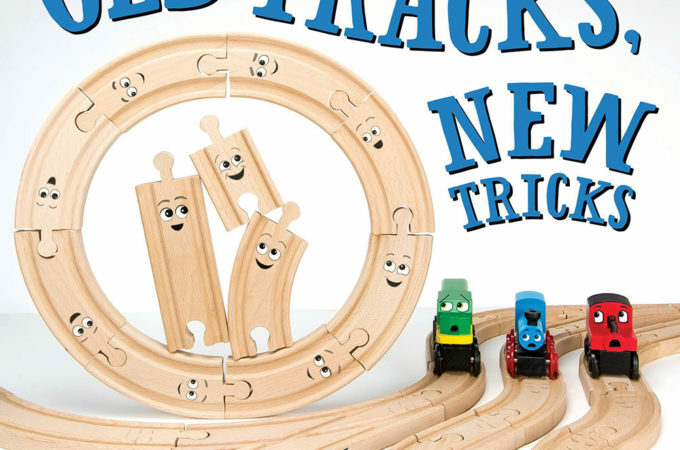 We used the figure-8 set from IKEA. I believe that set is only $10, so I figured if it got dirty while we were playing, it wouldn’t be a huge loss, but they’re staying clean enough so far. 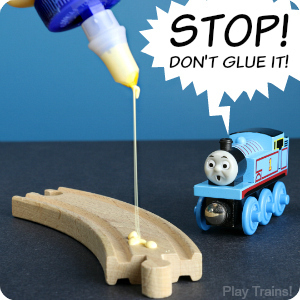 (I haven’t tried this, but I suspect you could coat the tracks with a non-toxic, glossy indoor/outdoor acrylic finish to make them more outdoor-friendly.) 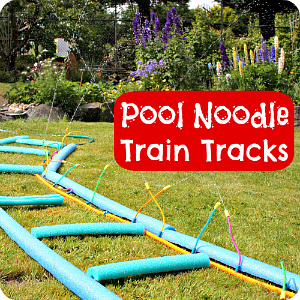 Note: You could also use plastic Trackmaster or Take’n’Play track and trains in these gardens. Suretrack clips or no-residue duct tape: This is really helpful for keeping the tracks together on the moss, and over any uneven areas in the pots. Other accessories: So far, we’ve used pebbles and little bits of plants for freight, as well as Schleich bunny figures and some Safari Ltd. Toobs animals. 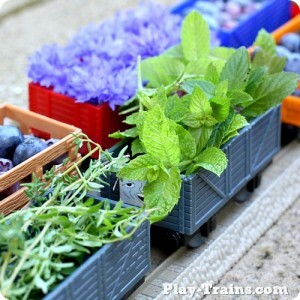 This train garden is perfect for incorporating the natural items we played with for our Toy Train Freight from Nature: Summer post, or any other small, safe objects you can find in nature. Plant low-growing, steppable plants, with flat plants like Irish and Scotch moss around the outside, and slightly taller ones in the center. Go for a mixture of colors, textures, and scents. 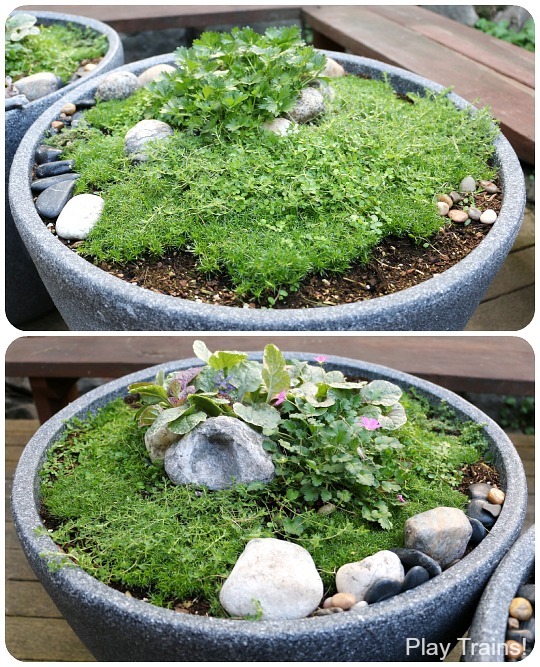 To save some money on this step, I divided up the steppable plants up into 2-4 clumps and planted them spaced apart, especially the moss, which I dotted around the outer circle. However, it took about a month and a half of sunshine and water for the moss to fill in enough to lay the track on, so if you want the train garden to be ready sooner, buy more plants. 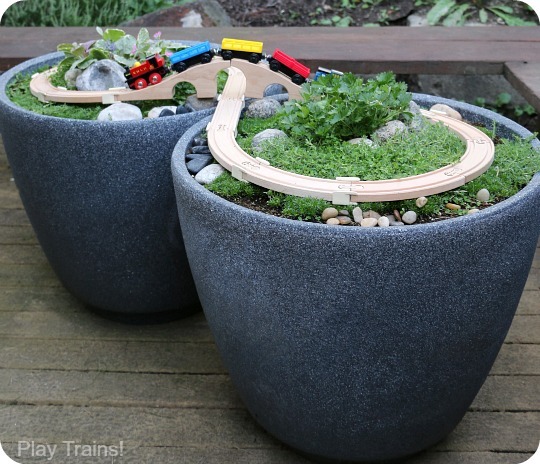 Add rocks in the inner regions of the pots to decorate the gardens, create more distinct locations for storytelling and pretend play, and — when necessary — to hold back the larger plants from encroaching on the outer circle where the track will be laid. Water well, and watch the garden grow! 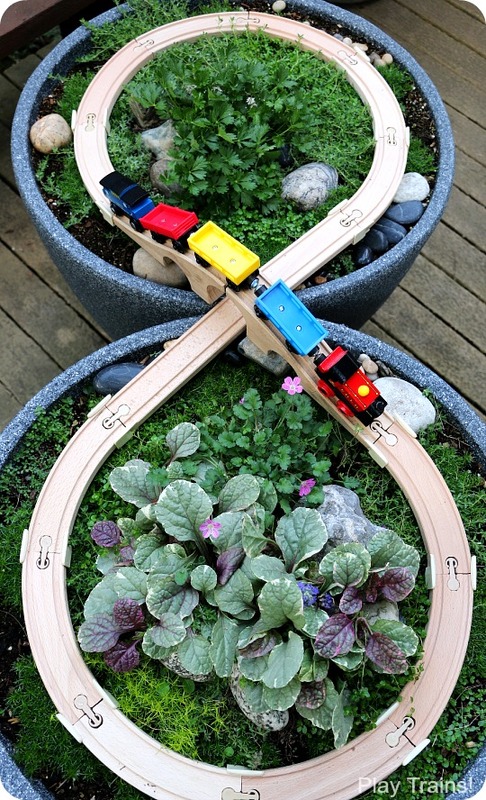 When the plants are established and filled in enough to support the track all the way around, it’s time to play! Here’s how I placed the IKEA figure eight set on my side-by-side pots. 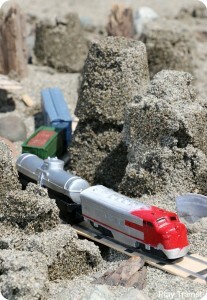 As you can see in the photo below, I used rocks to support the tracks where the tracks cross from one pot to another. 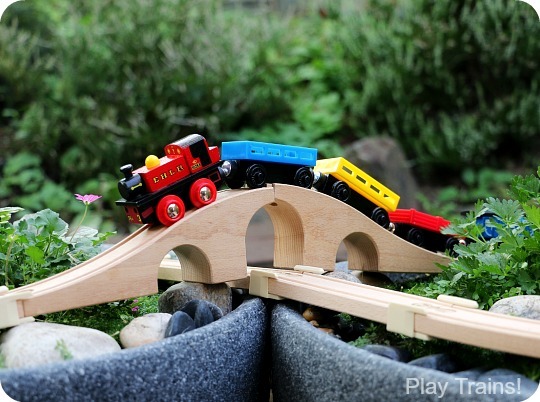 If I had been smart and filled the pots to the top, they might not have been necessary for the lower track, but you would still want to use rocks with a flattish side facing up to raise the bridge up higher — that’s how I made it tall enough for non-IKEA engines to pass beneath! 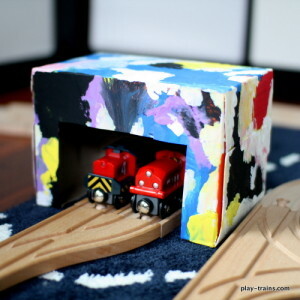 I would also recommend using either the Suretrack clips or no-residue duct tape to hold the tracks together. Our Suretrack clips really helped keep the track together on top of the slightly uneven surface of the carpet-soft plants. 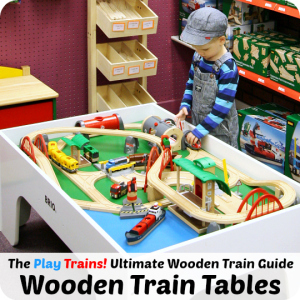 If you’re looking for a more traditional wooden train table to go inside your house, you can find out all the details you need to know in our guide to the best wooden train tables. 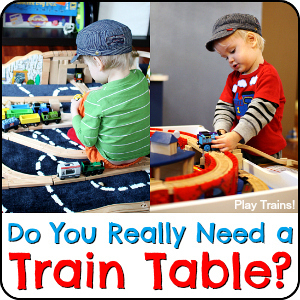 Make sure you also read my answer to the big question, Do You Really Need a Train Table?, and my list of temporary alternatives to gluing wooden train tracks to a train table. 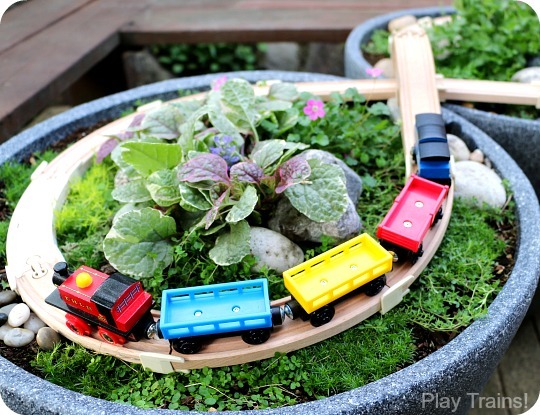 We’ve kept our train garden intentionally simple so far for the sake of versatility, but there are so many fun things you can do with garden small worlds — check out these fairy garden and outdoor small world posts for more ideas! This is brilliant! I seriously want to do it asap! 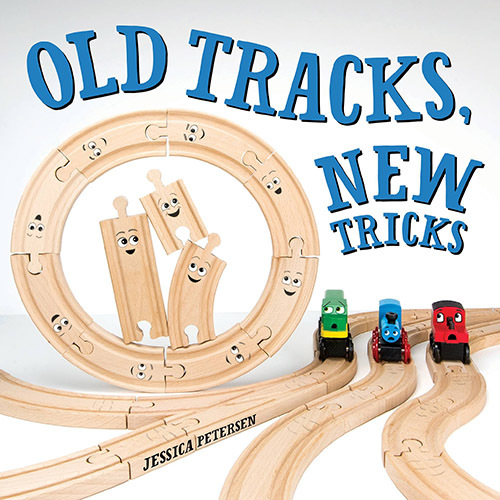 Have you noticed how the tracks respond to weather/rain? Or do you cover them? I’m pinning this too! I absolutely love this idea! 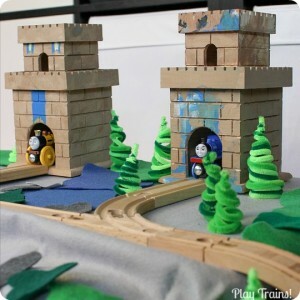 I am pinning it so I can make one for my train fans next year. This is adorable! I am wondering if you would be able to tell me the diameter of the tops of your pots? 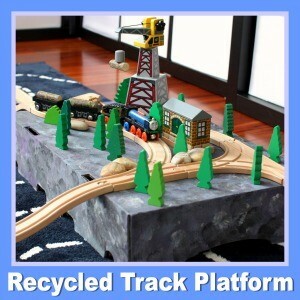 I want to make one for my son as a Christmas gift and plan on using the same track set. Thank you! Oh, um…I will try to go out and measure later! 🙂 From a quick measurement of a circle of track, I’m guessing the inside diameter of the top is around 22 inches…that would give a little over two inches on either side.